From routine meetings to serious deliberations, the modern Cabinet Room's oval table and leather chairs have provided a stately yet comfortable environment for the president to communicate his priorities and to listen to his Cabinet's opinions and advice. 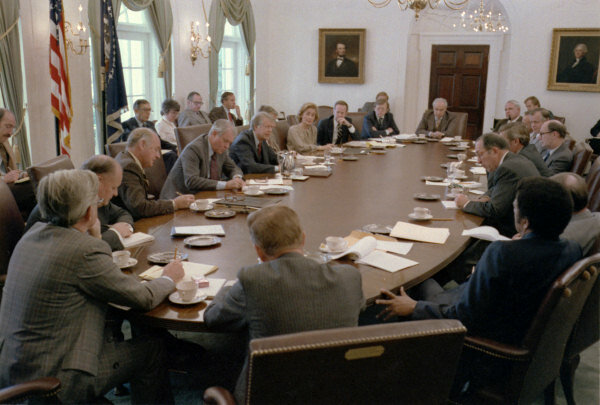 An oval mahogany conference table, a gift from Richard Nixon in 1970, seats 20. When the Cabinet meets around the table, each Cabinet member is assigned a chair positioned at the table according to the date the department was established. The president occupies the taller chair at the center of the east side of the table and has a call button available to summon a White House steward. The vice-president sits opposite the president. The Secretary of State, ranking first among the department heads, sits on the president's right. The Secretary of the Treasury, ranking second, sits to the vice-president's right. The Secretary of Defense (third) sits to the president's left, and the Attorney General (fourth) sits to the vice-president's left. The chairs bear brass plates indicating their cabinet position or positions and dates of service. When Cabinet members conclude their terms of service, their cabinet chair is traditionally purchased by the rest of the staff and presented as a gift. Overlooking the Rose Garden, the Cabinet Room contains likenesses of former presidents and statesmen, the choice reflecting the preferences of the current president. George W Bush has selected marble busts of Washington and Franklin and portraits of Theodore Roosevelt, Jefferson, Eisenhower, and Washington as well as a painting of the signing of the Declaration of Independence. If the walls of the Cabinet Room could speak they would tell of discussions and lively debate over national budgets, the state of the military, domestic and social issues and matters of national security. George W Bush convened a meeting on September 12, 2001 with his national security team in the Cabinet Room, where he declared that freedom and democracy were under attack. Nearly 40 years earlier, John Kennedy held intense discussions in the Cabinet Room during the days of the Cuban Missile Crisis. The Cabinet Room is a little over 23 feet wide and 39 feet long, with 18-foot ceilings. There are no second floor rooms above the Cabinet room or Oval Office. Among his first acts, first President of the United States George Washington persuaded Congress to recognize the Departments of Foreign Affairs (renamed State and given additional powers a few months after its creation), Treasury, and War. The heads of these executive departments would be given the title of "secretary." These became the president's first Cabinet. For its first hundred years, the Cabinet met in a second floor room of the Residence, usually what is today the Treaty Room. Until 1869, the space occupied by the current Cabinet Room was the White House stables and later part of the conservatories. Included in the 1902 "temporary Executive Office Building" addition was a Cabinet Room directly off Theodore Roosevelt's rectangular Executive Office. It was changed when the West Wing was expanded and made permanant during the Taft administration. It was changed again and moved in the 1934 reconstruction of the West Wing as a meeting room only for the use of the president. The thing that has changed most over the life of the modern Cabinet Room is the lighting. When he rebuilt the West Wing in 1934, Franklin Roosevelt had simple modern fixtures installed. John Kennedy had the ceiling covered with a bank of modern flourescent lights. Richard Nixon changed that to 19th-century empire style chandeliers inpired by Colonial Williamsburg. In 2006, George W Bush returned the lighting to the style of the original Roosevelt ceiling fixtures (which were not saved), as well as the original art deco eagle sconces.